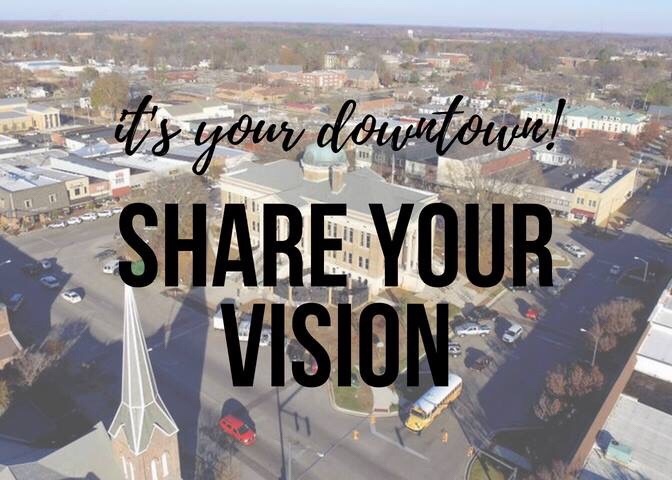 ATHENS, Ala. – Athens Main Street looks forward to engaging the community in crafting a vision for downtown Athens and outlining the goals for the Athens Main Street program during a Main Street Alabama Refresh Resource team visit August 27, 28 and 29. During the three-day process, the team from Main Street Alabama will conduct a community visioning workshop, interview various groups; including business owners, residents, civic organizations, and public officials, and make initial recommendations for the Athens Main Street program during a public presentation on the last day. The recommendations will be formalized into a written report provided six weeks after the visit. Backed by current market data, this report becomes the strategic plan for Athens Main Street. The public is encouraged to attend and participate in two important meetings during this visit. The first will be held on Tuesday, August 28 from 5:30 p.m. – 8:00 p.m. at Revival on Washington Street. This community visioning session will give community members an opportunity to provide input and express opinions about the future of Downtown Athens. The second meeting will be a Public Presentation of the recommendations of the Resource Team based on information gathered over the three-day comprehensive visit. The Public Presentation will be held on August 29 at 5:30 p.m. at City Hall. “An effective and strong Main Street organization is critical to our city. Strengthening and revitalizing our downtown is an important goal. Downtown belongs to everybody who lives here. It’s where we bring family when they come to visit, as well as business leaders looking at our community. It’s where we house our history, and it really is the heart of our city and county. This is the organization devoted to keeping that heart healthy,” said Athens Main Street Board President, Shane Black. During their three days in Athens, the resource team will be meeting with diverse groups to gather various perspectives for the future of downtown Athens. “The community is encouraged to participate and help build the vision for our beautiful downtown,” said Athens Main Street Executive Director Tere Richardson. Monday, August 27: Driving and walking tour of downtown Athens, industrial areas, parks, and schools. Individual meetings with key stakeholder groups to include Elected City and County Officials/Department Heads; Community/Economic Development Partners such as Chamber of Commerce, Economic Development, Bankers; Realtors and District Property Owners; local historian, art council and civic groups. Tuesday, August 28: Meetings and interviews with individual business owners. Interviews with local students. Interviews with faith-based community/pastors. On Street Community Engagement held on the Square. 5:30 p.m. – 8:00 p.m. Community Vision Session to be held at Revival on Washington Street. Wednesday, August 29: Resource Team individual field work and finalization of recommendations. Previous Entry:It’s your downtown! Share your vision!